Licence to Distill. Haig Whisky and James Bond. Did you know that Ian Fleming’s James Bond really drank Haig Whisky? Guest Blogger Tom J. Cull from Literary007.com shares the secret of Haig Whisky and James Bond with Stuart. “Don’t be vague, ask for Haig” says the slogan. A man like James Bond knows what he wants and it’s no surprise Haig whisky featured heavily in Ian Fleming’s novels of the 1950s and 60s. Contrary to the perception courtesy of the films, Fleming’s Bond is much more of a whisky and bourbon man than that of his famed vodka martinis. And it wasn’t just Bond that imbibed while on the job. His opposite number in the CIA’s Felix Leiter, kept up with him in the drinking stakes and often needed it more. Dare I say, in a pinch, he reached for the Haig. 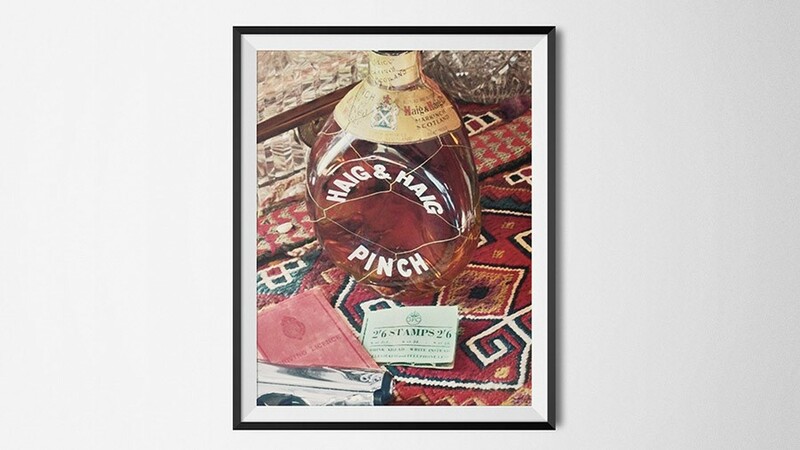 It was rather fitting then, that Haig had one variety for the British market – the Haig Dimple – and one for the US market – the Haig & Haig Pinch. With a slightly higher alcohol content than its British cousin, the Pinch was matured in old Bourbon oak casks from Kentucky. Leiter drinks Haig with Bond in Casino Royale and both can’t get enough of the stuff in Live and Let Die, drinking it down in at Sugar Ray’s in Harlem, Florida and in New York – “three inches of Haig and Haig in a tall glass with ice” to be precise. Not for nothing did Felix earn it though, after he lost a hand and a leg in a shark attack courtesy of Mr. Big. 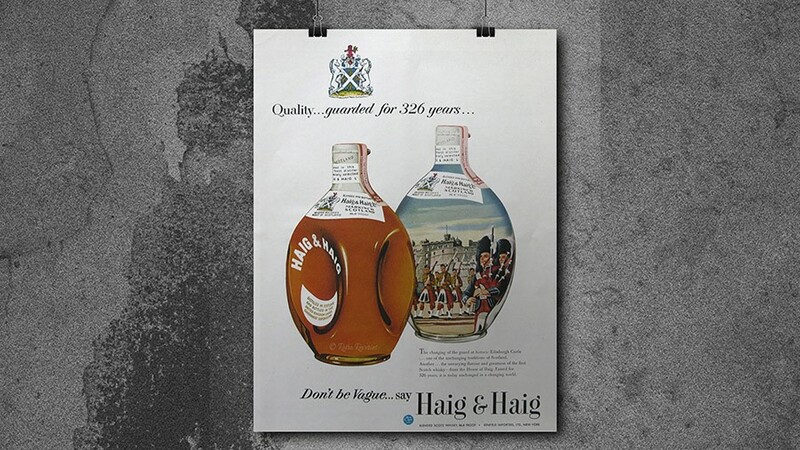 Don’t be Vague…Say Haig and Haig. 1950’s Bond era Advert for Haig Whisky. In the palpably tense short story The Living Daylights, Bond makes scrambled eggs, bacon, & coffee with a “liberal tot” of Dimple Haig as he prepares to take out a Russian sniper in Berlin. But it’s not just Bond and Leiter; Bond’s slightly shady associate Marc Ange-Draco in On Her Majesty’s Secret Service offers Bond some Dimple Pinch. To his credit, Fleming mostly seems to have discerned between Dimple and Pinch depending on who is drinking it and where – with the odd question mark. The villainous Hugo Drax has a bottle on his desk in Kent, referred to as Haig and Haig, but we won’t quibble. So was there a reason for Haig featuring so heavily in the books? Can we safely assume that Fleming liked to drink it or was it the storied history of this Scottish whisky that, as a Scot too, filled him with pride? During its heyday of the 1950s and 60s, boosted by advertising, it would have been an obvious choice as a brand known for exclusivity and wish fulfillment. Fleming was a pioneer of product placement in these books and it was known for him to fancifully put brands in the books in the hope of a little reward from product companies. Either way, the result of this biblious inclusion gave hope and the promise of better times to a post-war British audience in the 1950’s. 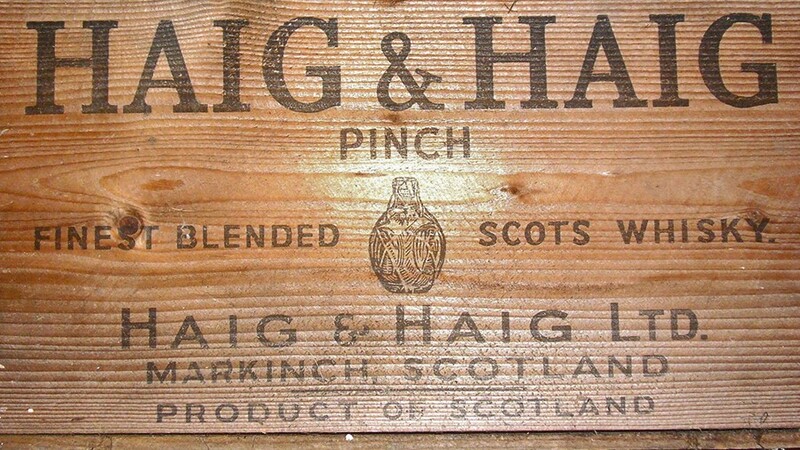 The legacy of both the Haig and literary Bond brands survives rather than thrives. In William Boyd’s Bond continuation novel Solo, he also has Bond drinking Dimple Haig, while snooping around an apartment in London, but not since. However, a resurgence in Haig whisky has begun. Plans were announced in early 2015 for the preservation of the original Haig Whisky Distillery in the Kennetpans near Stirling in Scotland. Until then, old stock looks set to run out within 10 years, so drink up!